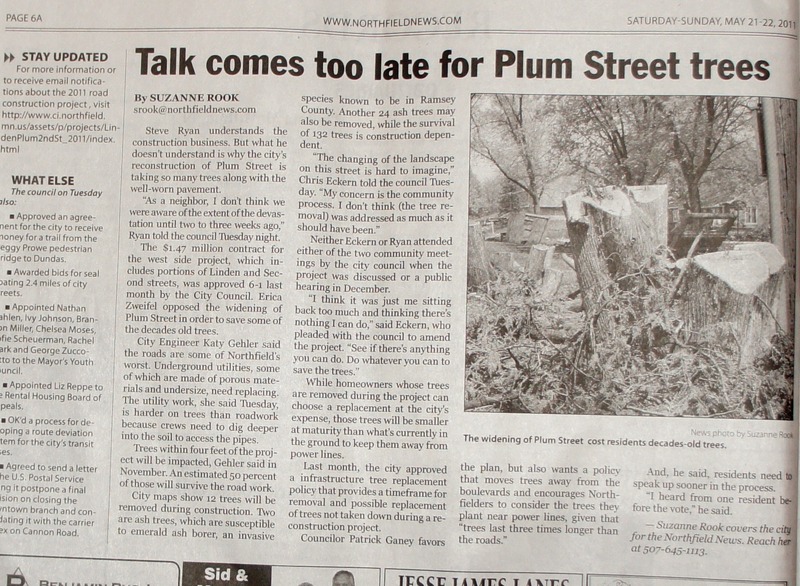 Northfield News’ use of Linden St photo for Plum St article implies that the trees have already been cut down. Not. This weekend, the Northfield News used a photo of the trees cut down on N. Linden St. to illustrate its Talk comes too late for trees story about the N. Plum St. trees, despite the fact that the trees on N. Plum have not yet been cut down. The photo was used for both the print and online versions of the story. It’s not an insignificant issue, as the residents of N. Plum St. are still pleading (at last Tuesday’s Council meeting and online, e.g. here and here) with city officials to halt plans to cut down the trees, evidently scheduled to begin on Monday. The widening of Plum Street cost residents decades-old trees. The past tense of the verb ‘cost’ indicates to the reader that the widening and the cutting have already been done. City maps show 12 trees will be removed during construction. Two are ash trees, which are susceptible to emerald ash borer, an invasive species known to be in Ramsey County. Another 24 ash trees may also be removed, while the survival of 132 trees is construction dependent. I’m not implying that the Northfield New has any hidden agenda on this issue. But it’s difficult to see how the use of the photo and the accompany tag line could be just a simple mistake or oversight. The News has long needed an ombudsman… or at the very least a proofreader. But as small town papers go, it’s a good one.